Ah, Barcelona. Lovely city. 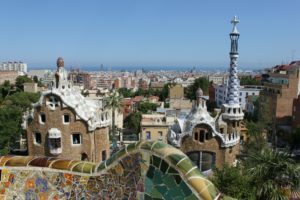 Famous for its gastronomy, football, fashion and its Architecture, specially buildings designed by Antoni Gaudi such as the Sagrada Familia, Casa Mila or Parc Güell. A very cosmopolitan city with inhabitants of all countries and cultures. Also a great place for foreign remote workers and professionals to live and work. A vibrant city with a very fast pace rental market, probably driven by foreign and national demand, and a shortage of properties to let. This has caused some sort of a rental bubble in the city and privileged surrounding areas such as the seaside (Gava-mar, castelledefels, Sitges) or more towards the mountains such as Sant Cugat and Valldoreix. It is estimated that rental properties are at their highest peak. Huge demand has caused an increase on rent of 20% to 30% in the last 12 to 24 months. An average 3 bedroom property in the city of Barcelona is let for around 1,400-1,500 Euro. This is very good news for those who own or want to buy property in Barcelona with the aim of letting them on a long-term basis. It is clearly a Landlord´s market and tenants very often see properties disappear from the rental market in 48 hours. This puts landlords in an even stronger position and allows them to ask for rents that would be unthinkable 2-3 years ago. Excellent news for landlords and not so good for prospective tenants as they are now facing higher rents but we should always look at the bright side. This is a sign that Barcelona, in spite of the last political events and the absence of a local Government, is thriving when it comes to the property market and rentals are their highest performer at the moment. And if a city thrives, then their inhabitants, businesses and commerce should benefit as well. The above only refers to long-term rentals. If we bear in mind that there is another market for holiday rentals, Airbnb and et al, then we can clearly see that Barcelona has a lot to offer to those foreign investors wanting to either get a property in a vibrant and sunny city like Barcelona or invest in a property that can be let with a good return. Some caution needs to be placed on holiday rentals as not all properties count with a touristic licence. The current Mayor is targeting holiday rentals with no touristic licence and the penalties and fines applied can be very high. In light of this, any person wanting to buy a property in Barcelona and exploit it as a touristic apartament should make sure that the property counts with the necessary licences. Alternatively, a long term rental would be a good solution as it still brings a good return in the current rental market. and get some independent legal advice if unsure as to the terms of the tenancy agreement. I am writing this post from Barcelona, at 6:30 pm. The sun is still shinning and the Barcelonians are getting ready for the weekend. It is probably time to log off and have a glass of cava or an estrella beer outside!